The call to prayer shoots down the Ihlara Valley like water from a newly breached dam. For a few seconds, it soaks into every gap the scene can spare; clambering up the escarpment, pushing beneath the smooth rock overhangs and floating along the new channels cut by the uncharacteristically flooded Ihlara River. And then there’s absolute peace again; the sheep in respectful silence and the willows with no breeze to fluster them. Few visitors to the Ihlara Valley venture further west than the village of Belisırma. Its riverside restaurants seem a logical end point; the concentration of centuries-old churches cut into the rock has reached a crescendo, the most dramatic canyon cliffs have been passed and the path on the left bank has peeled off onto the exit road. But continuing on the right bank gives a different experience. The chiselled canyon walls, staring down like a thousand Mount Rushmores, give way as the valley widens. The rock comes in layers, rather than nose- and cheek-like bulges, with avalanches of moss-covered mint-green cast-offs peppering the slopes. This is a different Cappadocia; one of broader sweep than the usual high-density blizzard of surreal detail. Yet look carefully, and signs of human life emerge: caves that have straight-edged rooms when you poke your nose inside; square slots that look like pigeonholes outside a block of flats; rectangular windows — so high up that no one could access them. Cappadocia is a place where nature gets kooky and man makes things even odder. The continual puzzles of why and how don’t just spark the imagination — they turn it into a roaring furnace. And often the answer lies in what’s not there. “Think of it as half an apple,” says guide Cem Güllüoglu outside the castle in Uçhisar. It doesn’t look much like a castle — more a sloppily upturned pudding sticking out on the hilltop. “It used to be much bigger, but a lot has fallen off or been eroded away, meaning you can see inside the core.” The windows, therefore, are not really supposed to be windows. They’re interior doorways — but the steps leading up to them have been wiped out along with the original rock facades. It’s thought that caves were being carved out and used by the Hittite Empire back in the second millennium BC, although much of the region’s troglodyte maze can be pinned to the latter centuries of the Byzantine period (397-1071). 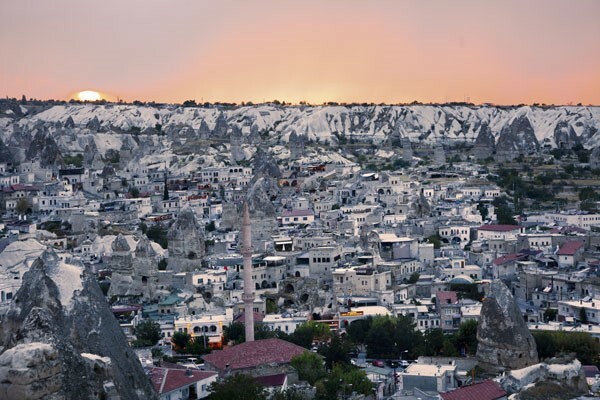 Cappadocia may be in the centre of modern Turkey, but it’s not particularly Turkish. The Turks didn’t arrive here until the 11th century, and Turkey didn’t exist until the 20th. Until the large-scale population swaps with Greece in the 1920s, many of Cappadocia’s inhabitants were Greek. This explains why many of the complexes burrowed into the rock are not mosques, but monasteries. The grandest of them all is the Göreme Open Air Museum, a visually striking treasure chest of centuries-old chapels, churches, kitchens and refectories. A giant, gnarled cone by the entrance — it looks like a KKK hood that needs a good wash — was once a five-floor dormitory for nuns. The interiors are even more remarkable than the exteriors. The paintings in some of the chapels are remarkably well preserved. They’re seccos, not frescos — painted on dry plaster rather than wet — but the detail is just as mesmerising. In the Snake Church, St George — who was from Cappadocia — and St Theodore are depicted slaying a dragon. But it’s St Onuphrius that elicits a double take — he’s a hermaphrodite with fulsome breasts and a long white beard. The Black Church — so named because its sole window was the only source of outside light — has every bit of wall and roof space covered. The individual scenes flit from Judas’s betrayal kiss to an angel showing Jesus’s empty tomb, but it’s the cumulative force that renders the visitor awestruck. Where it was not possible to excavate upwards, the Byzantines dug down, creating a network of underground cities. Only 10-15% of the one at Derinkuyu is now accessible to visitors, but it gives a sense of what a labyrinth it was. The system is remarkably similar to the one at Uçhisar Castle — it just goes in the opposite direction. The larger rooms are nearer ground level, used for stabling and storage, but it becomes a tighter squeeze the further in you go. It’d be fair to say claustrophobes are not going to enjoy the Derinkuyu Underground City. The tunnels connecting the levels are deliberately small and narrow — it wasn’t that the inhabitants were particularly small, they would’ve had to negotiate the maze hunched over in the same way visitors do now. The cities were uninhabited most of the time and retreated to in times of need. Thus they were designed for self-defence rather than comfort — between the fifth and 10th centuries, the region came under sustained attack from Arabic invaders. Assailants would have to come through in single file in the dark — the linseed oil-lit lamps occupying the still visible niches in the walls would have been extinguished. And the further down the enemy got, the more obstacles they’d encounter. Periodically through the cramped descent to 165ft below the surface, alcoves are dug into the wall. Inside them are heavy stone discs that can be rolled across the corridor. They’re immovable from the outside — you’d struggle to find a modern bank vault with higher-security doors — and a small hole in the middle allowed the defenders to stab spears through, picking off their foes one by one. The patterns across Cappadocia’s weird landscape repeat from settlement to settlement; the old villages are built around a central place of refuge — be it an underground city or easily defended high ground. As such defences have drifted into obsolescence, the cave homes on the hills have been abandoned in favour of modern new towns on the flat. Sometimes this leads to ghost villages, like the one at Çavusin. A hillside of crumbling homes stares back at onlookers, the dark holes cut for doors and windows looking like blinded eyes and howling, open mouths. Yet elsewhere, the old cave homes have been given a new lease of life. In Ürgüp, the Esbelli hill is a tough slog upwards from the city centre, but the decrepit old caves on it have been renovated. Some are home to former Istanbul urbanites who’ve decided to have a change and taste the rural life; others have been converted into small guesthouses and hotels for visitors who prefer to stay somewhere distinctive. The modern-cave look at the six-room Serinn House is a classic example — volcanic stone walls cut from the rock, and barrel-vaulted ceilings are paired off with self-consciously modern design-mag furniture. Such discerning digs are complemented by the Turasan Winery on the lower part of the hill. A visit quickly dispels any romantic images of peasants trampling grapes in vats. Turkey’s wine industry is surprisingly big, and Turasan’s operation is unashamedly modern. A peek around the back reveals towering, temperature-controlled fermentation tanks, and there’s a strong emphasis on consistency of taste in the wines available to sample. Sıra hotel in Uçhisar. Murat Yankı studied to be a sommelier in Italy and lectures on wine at two Turkish colleges. When he’s in Cappadocia, however, he offers wine tasting sessions that go far beyond lining up the glasses and sipping a few different varietals. His seminars go into the history of wine — starting with how the oldest traces have been dated back to a 7,500-year-old settlement in northwestern Iran. These are merely the oldest traces that can be accurately dated. The domestic grape has been cultivated in what is now Turkey since 8,000BC. I then learn about the ancient trading routes, where wine would be rafted down the Euphrates and Tigris to other civilisations, and how Cappadocia was the wine-producing hub for the Hittites. It’s possible the word ‘wine’ stems from the Hittite word wiyana. The lecture finishes with tastings of wines made from native Anatolian grapes. The cherry-chocolately Öküzgözü from the south west is arguably the best with Turkish casseroles, kebabs and grilled meats, while the delicate Narince is a fine accompaniment for oily fish and spicy chicken dishes. The dry, predictable weather patterns may not be perfect for grapes, but they certainly work well for hot air balloons. Standing in a darkened pre-dawn field, watching whirring fans turn flattened fabric into intimidatingly large buoyant orbs, Mehmet Halis Aydogan from Voyager Balloons tells how the balloon flight industry has, well, ballooned. “When we started in 1998, there were only five balloons available. Only 20 people could go up each day,” he says. “Now it’s 176 registered balloons, and 1,200 passengers. It’s not unusual to see 100 balloons in the sky at once. The industrial scale of the operation takes away the romance somewhat, but it adds to the spectacle, the bulging envelopes of a dozen balloons squidged against each other as they inflate in synchronicity. And when the flotilla takes to the sky, it adds an extra layer of photogenic majesty to the horizon. A balloon flight has a sense of grace that no plane or helicopter can begin to emulate. The basket floats peacefully at just the right height — high enough to get the full panorama, but low enough to be able to pick out the detail. The experience opens the eyes to how bizarre Cappadocia is. In places, the rock looks so smooth it may as well have been vacuum-formed. In others, pudgy-bottomed pink-and-red formations peel off from the main hillside like petals. Narrow, sheet-like ridges spider out from flat-topped mountains and absurd ‘fairy chimneys’ with their precariously-balanced stone caps stand to attention like comical army cadets. There’s an awful lot going on, but start piecing the jigsaw together and the bombardment of quirky geology begins to make sense. The table-like mountains aren’t mountains at all — they’re all roughly the same height and part of the same plateau. It’s just that valleys and gorges have been cut through soft stone that’s little more than volcanic ash pressed together. The rock formations are part of that plateau too — the coloured stripes match up at just the right level. They’ve been chipped away at over thousands of years; wind attacking from the side; rain from the top — which freezes and expands in below-zero weather to further split already porous surfaces. The rain, when it does come, has another effect. It brings out an array of colours in the rocks that can be choked and muted by the dusty summer. Just to the north east of Göreme, ridges spread forth from one of the plateau’s remaining table tops, like spindly fingers from a chubby palm. After the storm, the ravishing reds and roses that give the valleys their name are in full flourish. The walking trails that loop around them, ducking between rocky bulges and meandering along precipices, supposedly have distinct identities. But attempt to follow one and you’ll more than likely end up on another; it’s far better to abandon the rudimentary maps, tackle path junctions on a whim and head in a broad, general direction. These unregimented turns lead to a million-and-one views that tour buses would deviate for miles to see if they could get down the tracks. The point comes when asking questions and trying to work things out seems a superfluous distraction to gibbering with glee and enjoying what’s on display. Beyond the apricot trees and wild olives, the path leads me to a cave door. Head poked round, the floor is a chalky white but the eyes go up to meet columns and side chapels as proud and possessing as those to be found in any cathedral. A few tiny specks of paintings remain, but it’s the simple purity of the Columned Church’s form that produces a magic spell. Time will continue to alter Cappadocia, shearing once-arresting formations into dust and etching out new ones to replace them. But occasionally it freezes, creating a moment to get lost in — a moment of total surrender to childlike wonder. Public transport is scarce. A hire car is a good option, as is a taxi between towns. 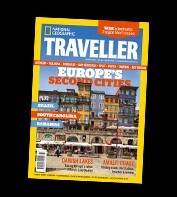 But organised tours are often the best way to fit in most key sites. Argeus has well-trained guides. Summer, especially July-August, can be very hot, and the winter too chilly for such an outdoorsy region. May, September and October hit the sweet spot. Visas are also available on arrival. Currency: Turkish lira (TRY). £1 = 2.74 lira. Health: It’s advisable to get vaccinated against hepatitis A before visiting.